A parliamentary report of 1777 recorded a parish workhouse in operation at Ledbury for up to 100 inmates. This is thought to have been located on Church Street, and later used as a boys' school. County of Hereford: Ashperton, Aylton, Bosbury (2), Canon Frome, Castle Frome, Coddington, Colwall, Donnington, Eggleton (Township of Bishop's Frome), Ledbury (4), Little Marcle, Munsley, Much Marcle (2), Parkhold (Township), Pixley, Putley, Stretton Grandsome, Tarrington, Woolhope, Yarkshill. The population falling within the Union at the 1831 census had been 11,973 with parishes ranging in size from Parkhold (population 57) to Ledbury itself (3,852). The average annual poor-rate expenditure for the period 1834-36 had been £5,678 or 9s.6d. per head of the population. A new union workhouse for 150 inmates was built in 1836 to the north-west of the town on what became Union Lane (now Orchard Lane), for which the Poor Law Commissioners authorized an an expenditure of £3,970. 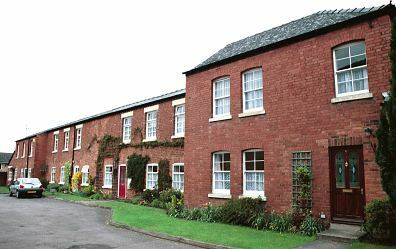 The architect was George Wilkinson who was responsible for other Herefordshire workhouses at Leominster, Bromyard and Weobley. His design followed the popular cruciform or "square" plan with an entrance block at the front, behind which lay the four accommodation wings radiating from a central hub, creating yards for the different classes of pauper (male/female, old/young). The workhouse location and layout are shown on the 1903 map below. After 1930, the workhouse became a Public Assistance Institution under the name Belle Orchard House. After 1948 it became an old people's home. The building's central hub and inner cross-ranges have been demolished. The surviving sections are now used for residential accommodation. Ledbury entrance block from the south, 2001. Ledbury from the east, 2001. Ledbury north range from the south-east, 2001. Herefordshire Archives and Record Centre, Fir Tree Lane, Hereford HR2 6LA. Holdings include: Guardians' minute books (1836-1930); Apprentice indentures (1848-85); Marriage notices book (1842-1912); etc.